In C#, arrays support covariance, but generics do not. Generics aren’t covariant in order to avoid the problem that we have with covariant arrays. With arrays, we get type mismatch exceptions when trying to put something into the array of the wrong type. The core problem here is that the array looks syntactically like an array of the base type, but is actually an array of the more derived type. 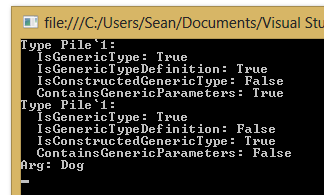 Generics in C# aren’t covariant in order to avoid this same problem. The language designers decided to support covariance for arrays but not for generics. The reasons are likely more historical than technical. // The problem with array covariance. Generics in C#, however, are not covariant (they are invariant). The following code will not compile. You can use the typeof operator to get information about one or more type parameters within a generic type. In the example below, we get information about the type argument used when the generic type is constructed. You can use the EqualityComparer<T> type to implement IEquatable<T> for a generic type. In the example below, we implement IEquatable<TwoThings<T1,T2>> for our TwoThings<T1,T2> type. The EqualityComparer<T> type is used to properly compare member data, regardless of the types. Without this, the compiler wouldn’t know how to compare two T1 or two T2 objects. Now suppose that we construct this class using types that implement value equality. The Equals method then behaves as we’d expect. If a type parameter in a generic class is constrained to be a reference type, using the class designator, then the == and != operators used for this type parameter will perform a check for reference type equality. This is true even when the type provides a more intelligent equality check by overloading the == operator. Assume that we overload == for the Dog type to do an intelligent equality check. Below, the == operator performs a reference type equality check on the type parameter.